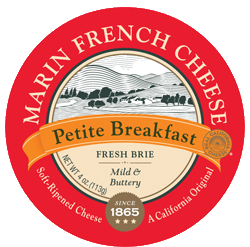 Marin French Breakfast Cheese is a California original – a fresh unripened Brie made in our Marin Creamery since the late 1800’s. We put Breakfast Cheese on San Francisco’s saloon menus back in the days when men grabbed salted meat, pickled eggs and a mug of steam beer before heading to the docks to unload cargo from around the world. We’ve made Breakfast Cheese for over 100 years. It’s that good! At Marin French we honor tradition but we’re not afraid to break with it. We’re just as crazy for innovation. For today’s savvy cheese lover we added a dollop of cream to Breakfast Cheese, fluffed it to 4 ounces and renamed it Petite Breakfast. It’s a fresh expression of our sweet local milk and cream, captures the essence of cool coastal breezes rolling over our Petaluma creamery and satisfies a craving for creamy, tangy fresh cheese with morning toast or evening cocktails. Older PostMeet Kristy, Our New General Manager!